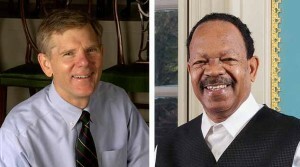 Left, scholar and educator Brock Jobe and, right, conservator Leroy Graves. NEW YORK CITY — The Wunsch Americana Foundation has named Brock Jobe and Leroy Graves the 2017 recipients of the Eric M. Wunsch Award for Excellence in the American Arts. The winners will be honored at a reception at Christie’s Rockefeller Center at 5:30 pm on Wednesday, January 18, during Americana Week in New York. The award, bestowed annually, honors the memory of Martin Wunsch, a collector of American decorative arts and Old Masters paintings. Jobe, a scholar, curator and longtime instructor in Winterthur Museum’s Program in American Material Culture, and Graves, a conservator of historic upholstery at Colonial Williamsburg, are known for their mentorship of younger colleagues. Both men exemplify the commitment to community that characterized foundation founder Martin Wunsch, who liked to create opportunities for scholars and collectors to assemble in settings conducive to intellectual exchange. Speaking to Antiques and The Arts Weekly, foundation president Peter Wunsch said he was struck by the warmth, sincerity and humility of the honorees, both of whom have large and devoted public followings. Called the man with the “million-dollar hands,” Graves, who joined Colonial Williamsburg in 1967, worked as an art handler before being named to the museum’s fledgling conservation department in 1984. He is a widely recognized authority on upholstery conservation and is the author of the 2015 book Early Seating Upholstery: Reading the Evidence. Jobe retired from a full-time position as Winterthur’s professor of American Decorative Arts in 2015 after 22 years with the museum. He is currently collaborating with Christie Jackson, a former student, and the dealer Clark Pearce on a book on Massachusetts cabinetmaker Nathan Lombard. Jobe led the Four Centuries of Massachusetts Furniture project, a collaboration of 11 cultural institutions that resulted in a series of related exhibitions and programs in 2013 and 2014. He is editing a companion publication on the subject with Gerald W.R Ward. Jobe began his career at the Museum of Fine Arts, Boston, before working at Colonial Williamsburg and Historic New England. His best-known books are Portsmouth Furniture: Masterworks from the New Hampshire Seacoast and Harbor & Home: Furniture of Southeastern Massachusetts, 1710–1850. “I am especially pleased to join Leroy Graves as a co-recipient of the Wunsch Award. I have known Leroy since 1975 and have enormous admiration for his skill, knowledge and kind and generous spirit. It will be an honor to join him at the award ceremony,” Jobe said. Directed by Peter Wunsch and his sons, Eric and Noah, the Wunsch Americana Foundation funds educational and preservation initiatives in the American arts. Objects from the Wunsch Collection are displayed at partner museums and institutions around the country. Past recipients of the Eric M. Wunsch Award for Excellence in the American Arts are Patricia E. Kane, Linda H. Kaufman and the late George M. Kaufman, Richard H. Jenrette, Chipstone Foundation, Arnold Lehman, Morrison H. Heckscher and Peter M. Kenny. For more information on the New York City-based Wunsch Americana Foundation, visit www.wunschcollection.com.